What do Chinese doctoral students in Germany experience as culture shock? For both Dr Keshun Zhang and his wife Shuang Song, one shared answer to this question is "bullet points". "What are bullet points? We never thought to use bullet points!" exclaim the married couple in cheerful harmony as they recall their early university study experiences in Baden-Wuerttemberg, Germany. "Preparing bullet points with short phrases is efficient and makes meetings with supervisors clear and focused", explains Keshun. "I use them now for everything, from presentations and proposals, to interviews", he adds enthusiastically. To use bullet points instead of writing full texts for meetings is just one of many helpful tips Keshun and Shuang include in their popular book "When a Chinese PhD Student Meets a German Supervisor: Tips for PhD Beginners". It is the second volume in the University of Konstanz book series "University from the Inside – Job profiles, Career Paths, Personnel Development", which is edited by Dr Thomas Goetz, Professor for Empirical Educational Research at the University of Konstanz and at the Thurgau University of Teacher Education in Switzerland, and Dr Bettina Duval, the head of Academic Staff Development (ASD) at the University of Konstanz. First published in October 2016 via the Konstanz Online Publication System (KOPS), the digital Institutional Repository of the University of Konstanz, the PDF version of the book has now been freely downloaded over 100,000 times, more than any other open access publication at the university. Both Keshun and Shuang have become very familiar with the university during their time in Konstanz. Keshun is a post-doctoral fellow at the Zukunftskolleg who previously carried out his doctoral studies in psychology at the Graduate School of Decision Sciences at the University of Konstanz. His wife Shuang lives in Konstanz but completed her master's studies in Germany and is currently a doctoral candidate in English linguistics, both at the University of Freiburg. Through their collaboration, the authors were able to bring their shared intercultural learning experiences and those of other Chinese PhD students at the University of Konstanz to life in both the English and Chinese language. The idea for this book project emerged through Keshun's close working relationship with his doctoral supervisor, Dr Thomas Goetz. He encouraged Keshun to write this book after "successfully learning to bridge our cultural differences in regard to working together". His belief is, then as now, that their collection of shared learning experiences "can benefit other Chinese doctoral students and their supervisors in Germany". The 80-page volume, which includes 22 colour pictures drawn by Shuang, illustrates the experiences of Ming, a fictional Chinese doctoral student in Germany who encounters, in effect, the same challenges that the authors and their Chinese colleagues were confronted with. In addition to providing many practical tips on how to navigate German academic culture, the authors address two major themes throughout their book: intercultural understanding and open communication. In China, Ming had learned that it is rude to openly disagree with the opinions of a Chinese superior or colleague and that reporting bad news could be viewed as complaining. Chinese students may also hesitate to report problems or ask for help due to a fear of showing weakness. Now in Germany, Ming does not want to speak up for himself, discuss his problems, or ask for help because he does not want to burden anyone. Through this scenario, Keshun says that he wants to remind other international students "that reporting a problem and requesting assistance is not about showing your weakness, it is about showing reality." He advises Chinese students to communicate both good and bad news – whether it relates to research, work, or financial issues and encourages them to ask for help early on. "This can lead to constructive collaboration with colleagues and supervisors and prevent misunderstandings and potential project delays", he adds. At the same time, German supervisors may not realize just how important they are to their Chinese doctoral students, not just in academia, but in life in general. They may benefit from understanding that Chinese doctoral candidates view their supervisors as the most important people during their time abroad and therefore greatly value their experience, feedback and support. For Ming, his supervisor is not just a superior, but also a mentor. After all – and as Ming is reminded in the book – the Chinese believe that "a teacher for one day is a father for a lifetime". The book "When a Chinese PhD Student Meets a German Supervisor: Tips for PhD Beginners" was not just written for Chinese doctoral students and German supervisors, but also for International Office staff members as well as those who are either curious about Chinese culture or interested in viewing German culture through international eyes. Since the book's publication, Keshun and Shuang have received many emails and questions about studying in Germany from readers from around the world. In fact, the book was so popular in the first week it was published that the KOPS website crashed due to the large number of simultaneous download attempts. The Chinese embassy in Germany now sends the book's KOPS website link to Chinese doctoral students in Germany. Additionally, Keshun was recently interviewed and cited by a US-American journalist who wrote a Career Feature article that was published in the 24 May 2018 edition of the scientific journal Nature. Furthermore, he has been invited to speak as a guest lecturer on the topic of doctoral studies in Germany by several other universities, in both China and abroad. Keshun and Shuang are both thrilled that their publication has surpassed the 100,000 download milestone so quickly. Why is this book so popular? Thomas Goetz believes that the high demand for the book can be explained by its high practical relevance for both doctoral students and their supervisors: "The book with its straightforward text and fun drawings is not about critiquing culture, but about common and shared challenges, and about how to meet those challenges". 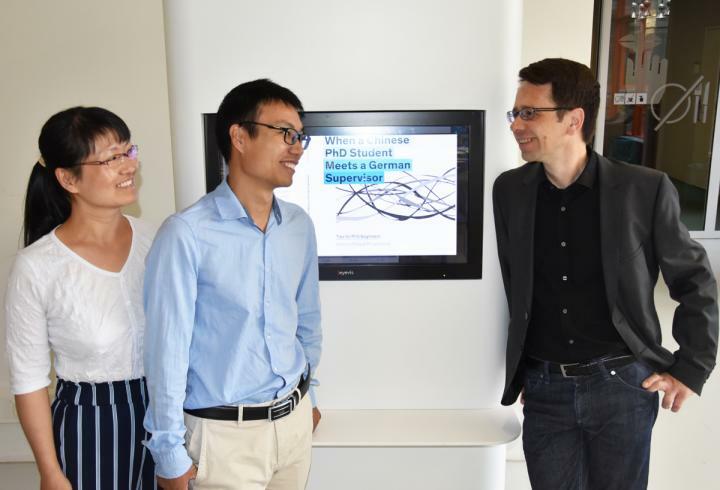 Keshun and Shuang also believe that its popularity can be traced back to the fact they have made it freely accessible in Konstanz via the university's open access KOPS server. "It is important for us that everyone can share in our experience," says Keshun. And this experience includes, of course, his newfound preference for using bullet points. – Book "When a Chinese PhD Student Meets a German Supervisor: Tips for PhD Beginners" written by Chinese early career researchers Dr Keshung Zhang and Shuang Song on the topic of intercultural understanding between Chinese doctoral students and German supervisors. – Book published in Konstanz Online Publication System (KOPS) surpasses 100,000 download milestone – with more downloads than any other publication. – Includes practical tips on how to navigate German academic culture as well as insights into intercultural understanding and open communication. – Target audiences include Chinese doctoral researchers, German doctoral supervisors, International Office staff members as well as anyone curious about Chinese culture or interested in viewing German culture through international eyes. – Keshun Zhang to speak on the topic of doctoral studies in Germany at universities in China and abroad.